Virginia @ Duke (LF Sports): CRIPPLE FIGHT!!! Seriously, Duke stands a good chance of winning this one. Virginia can’t move the ball to save their lives. Toledo @ Pitt (ESPNU): I don’t really hae anything to say about this one. Go Rockets? Tennessee @ Memphis (ESPN): So, wait, a dominant state power agreed to actually play at a lesser school’s home stadium? Heck, they agreed to play them at all? Amazing, but call me when Alabama or Auburn go to UAB or Troy. Wisconsin @ Indiana (ESPN2): Go badgers, I guess. Mississippi State @ Louisiana State (LF Sports): MSU, no chance to survive, etc., etc. Colorado @ Missouri (FSN): 16 years ago, on October 6, 1990, an event happened that almost never happens in college football. Colorado was down 31-27 on their last chance drive at Misouri. Their national title hopes hung in the balance – at the time, they were 3-1-1. 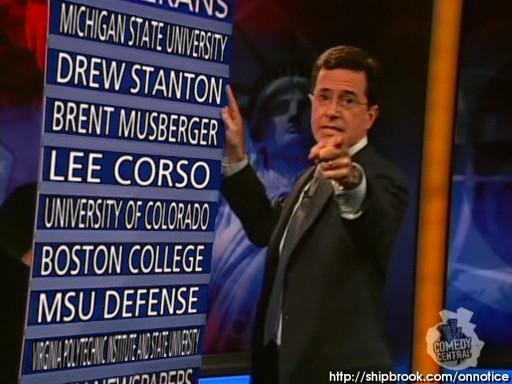 Someway, somehow, Colorado was granted a 5th down. Pay careful attention when CU gets to 1st and Goal – they spike on first down, but they don’t increment the downs, so they run again on first down, and then on 2nd. They spike again 3rd (really 4th) down, and score the winning touchdown (disputable) on 4th (really 5th) down. And people thought those Oklahoma-Oregon guys were incompenent. Why am I ranting about this? Well, another team went 11-0-1 that year. That was Bobby Ross’s Georgia Tech squad. Tech finished first in the UPI (now the AP) Poll, CU finished first in the coach’s poll. Yeah, that’s right – a team that a) lost a game and b) needed a 5th down to win another somehow got a share of a national title. Amazing. Because of the bowl situation back then, CU and GT never had a chance to play on the field. 2:30 – Purdue @ ND (NBC): ND probably wins. I’m really pissed off now after watching that video. Alabama @ Florida (CBS): UF should roll here. Alabama didn’t look good at all at Arkansas. Georgia Tech @ Virginia Polytechnic Institute and State University (ABC): Yes, that really is the full expansion of Virginia Tech’s name. This is pretty much the game of the day. The ACC Coastal title is probably at stake here, and it’s tough for me to say who will win. Regardless, it won’t be 51-7 again. Rice @ Army (ESPNU): Go Bobby Ross and USMA! Ohio State @ Iowa (ABC): Honestly, I’m glad we’re not down here. Lane Stadium is pretty crazy as-is, and it’s much worse at night. Again with the rolling, though, as that’s what OSU should do, but Iowa stands more of a chance than WSU, LaTech, and Kansas. Michigan @ Minnesota (ESPN): Michigan may be the first team from the Big Ten to actually be underrated. OSU-Michigan should be incredible this year. 9:00 Georgia @ Mississippi (ESPN2): Not quite “Fast Animals, Slow Children”, but should be a bloodpath again. Unless Stafford plays most of the game again. At any rate, Go Rebels! 10:15 Stanford @ UCLA (FSN): Go Trees, er, Cardinal! This entry was posted in Uncategorized on September 28, 2006 by ASimPerson. – #24 Penn State 3, #1 Ohio State 0. Ohio State’s defense finally picked off Nittany Lion QB Morelli to end the game late in the fourth quarter. – #2 USC 3, Arizona 0. The final score was USC 20, Arizona 3. Didn’t ESPN say USC’s offense reloaded? – #4 West Virginia 14, East Carolina 7. East Carolina’s mascot is a pirate. They have lost to Navy and UAB. Those facts alone show how silly this score looks. – #6 Michigan 10, Wisconsin 10. This one isn’t that embarrassing, I guess. – #8 Louisville 10, Kansas State 0. Kansas State beat Illinois State by one point to open their season. 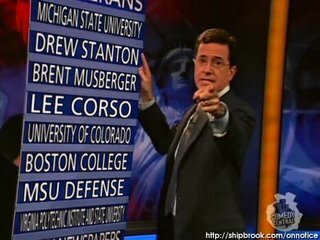 – Colorado 13, #9 Georgia 0. Without two fourth-quarter touchdowns, Georgia would have lost to the Colorado team that lost to I-AA Montana State the first week of the season. If quarterback troubles continue in Athens, I don’t see Georgia beating Tennessee, Florida, Auburn, or Georgia Tech. – #3 Auburn 10, Buffalo 0. Auburn did pull away to a 38-7 victory (well below my 117-0 prediction). However, Auburn’s defense, run and pass, looked anemic against Buffalo’s offense. This is Buffalo’s offense about which I am talking! I’m going to give myself an extra point for not ending the previous sentence with a preposition. Speaking of extra points, I bet Alabama placekicker Leigh Tiffin wishes he could have the one I just gave myself after his performance on Saturday. He is shaping up to challenge John Vaughn for “Least Clutch SEC Placekicker.” Everyone says they feel sorry for these guys, but I’m not so sure we should. When a quarterback throws three interceptions in a game (see Drew Stanton against Notre Dame), no one cuts him slack. Why should we cut a kicker slack for missing three, four (see Tiffin against Arkansas), or five (see Vaughn against LSU in 2005) kicks that would have made the difference in the game? 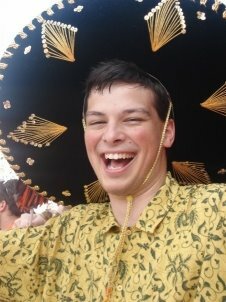 On a random note, I wore my authentic Mexican sombrero to the Auburn/Buffalo game this weekend. I told people that if Auburn was going to schedule opponents as ridiculous as Buffalo, I was going to dress for the occasion. In addition to being hilarious, the sombrero provided some welcome shade from the blistering sun, which produced an 85-degree heat wave in Jordan-Hare. I’m not sure if the people behind me appreciated it as much as I did. Thankfully, some tidbits of college football news offered hope rather than leaving question marks. Florida State destroyed Rice 55-7. Mississipi State finally won a game, beating UAB 16-10 in overtime. Actually, I guess that was all the hope I saw in the scores. I’m proud to say that Laura watched most, if not all, of the Michigan State/Notre Dame game. I am only sorry that the Spartans could not hold on to the ball long enough to pull off the “upset” for her. Next weekend looks to be a slight improvement over the previous one, although that isn’t very hard to accomplish. #3 Auburn goes to South Carolina Thursday night (7:30 PM ET, ESPN). On Saturday, #5 Florida hosts Alabama (3:30 PM ET, CBS). Both should be closer games than the rankings would indicate. Georgia Tech visits Virginia Tech (3:30 PM ET, ABC), and Ohio State goes to Iowa (8 PM ET, ABC). I’m looking forward to both of these games but for different reasons. The first might decide the ACC Coastal Division champion, while the second is another chance for Ohio State to lose. Go Hawkeyes! This entry was posted in Uncategorized on September 25, 2006 by Kenneth. I was almost completely wrong about CU @ UGA. But, hey, when you need a last minute TD to beat a team that lost to Montana State…. Also, I guess Matt Stafford is no longer the second coming of Christ.